Find someone in Skyrim to marry. Speak to Maramal about marriage. Find a potential spouse who you wish to marry and who is willing to marry you. Wear the Amulet of Mara and ask them to marry you. Go to the Temple of Mara and attend your wedding ceremony. Select a house for you and your new spouse to move into. 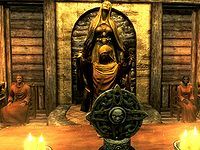 If you are interested in getting married, you must first speak to Maramal in the city of Riften. He can initially be found in The Bee and Barb tavern preaching to the locals and later at the Temple of Mara. Talk to him about marriage and he will instruct you to obtain an Amulet of Mara; a holy symbol of the goddess of love. At this point, you may purchase one from him for a small fee, or find one in random loot throughout the game. Any Amulet of Mara will do, so if you already have one before speaking to Maramal, there is no need to buy one. 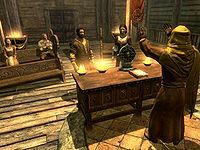 Now you must find an NPC in whom you have an interest (A list of eligible NPCs can be found here). The person that you wish to marry must have a high disposition towards you. This can be achieved by doing favors and completing quests for that character. When you have met your ideal spouse, you must approach them while wearing the amulet. This will give you new dialogue options concerning marriage. Ask the person to marry you. If they agree, you will need to organize a wedding ceremony. Return to Maramal to tell him that you are interested in getting married at the Temple of Mara. He will be delighted and will announce that the wedding will take place the very next day; from dawn until dusk. Early the next morning your spouse will be waiting for you in the Temple of Mara. Upon entering the building, you will walk down the aisle and take part in an age-old tradition between two people. You will be required to say your vows, with prompting by Maramal. You are now legally married! The first decision you must make is where to live. You may live in your spouse's home or any house that you have purchased. This decision is not permanent; if at any time you want to change residences, choose the "I'd like us to move somewhere else" dialogue option. You can call off the wedding during the ceremony if you no longer wish to get married. However, this will cause your guests, fiancé, and Maramal to be upset with you. Make amends with your spouse, and then speak to Maramal again. He's naturally distressed by your actions, but he'll agree to give you another chance. You'll also have a dialogue option with your now former fiancé to say "I never loved you anyway," which will cause you to be unable to marry that NPC thereafter. Unlike other quests, once you schedule the wedding, you cannot actually have the wedding whenever you feel like it. If you do not attend the wedding at the time specified, you will fail the quest and upset everyone in attendance the same as if you had called off the wedding. You may be married only once. If your spouse dies, you will not have the option to marry again, although an unused script exists to allow remarriage. Remarriage is currently only possible with the Unofficial Skyrim Patch. The guests at your wedding include a number of people who have a high disposition toward you or your spouse; your friends will be seated on the northern row of pews, and your spouse's friends and family will be seated on the southern row of pews. This can potentially include people you have never met before, e.g. Jarls who took the throne after you took over a hold in the Civil War. Potential spouses are not restricted by gender. Maramal says to meet back "tomorrow, from dawn til dusk". Technically this is incorrect; if you first asked him to host the wedding at 1am, he will conduct it at 11pm that night. Simply try waiting some hours until Maramal begins his wedding dialogue. You may also have to leave and then re-enter the temple if it still does not work. If a follower has been killed prior to this quest, they may drop through the ceiling of the Temple of Mara at the same time that your spouse and his or her family (if they have any) arrive. This causes you to automatically fail your marriage attendance. Luckily you can talk to your spouse again and usually the wedding goes through glitch free, though users wishing to avoid all this should not take followers on particularly risky adventures. One of the wedding guests may inexplicably be a Bandit Chief who will attack the other guests, ruining the wedding. Only known fix is to purposefully fail by not showing up inside the temple, then begging your fiance for forgiveness and attempting a second time. When guests are already assembled and your fiance is present, Maramal may be inactive and an attempt to speak to him results in "This person is busy" dialogue option. ? Using the console command SetStage RelationshipMarriageWedding 100 helps to complete the wedding ceremony and triggers the next step. The following empty quest stages were omitted from the table: 0, 5, 10, 15, 100, 250. On the PC, it is possible to use the console to advance through the quest by entering setstage RelationshipMarriage stage, where stage is the number of the stage you wish to complete. It is not possible to un-complete (i.e. go back) quest stages, but it is possible to clear all stages of the quest using resetquest RelationshipMarriage. Esta página foi modificada pela última vez à(s) 08h28min de 11 de dezembro de 2015.